Culms: Stiff, erect, hollow, and smooth. Blades: Flat or rolled inward, narrow, often stiff and ascending, 2 to 8 inches long, about 1/10 inch wide, glabrous or lightly hairy, pronounced ridges above. Sheaths: Open margins, glabrous to hairy. Ligules: Short, membranous, collar-shaped, irregularly notched; auricles prominent, often purplish. Inflorescences: Spikes, dense, bristly, 3 to 6 inches long (excluding awns), terminal, sometimes partially enclosed in upper sheaths. 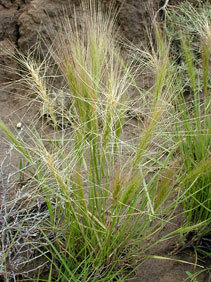 Spikelets: 1-3, on alternating sides at each node, 2-6-flowered; glumes and lemmas with rough awns 1 to 3.5 inches long. Habitat: Found on dry prairie uplands, pastures, roadsides, and waste ground. Distribution: Occurs in the west third of Kansas. Forage Value: Squirreltail has little forage value for livestock or wildlife. Comments: Tufted. The awns spread wide when mature, giving the inflorescence the appearance of a bottlebrush. The awns can cause injury to the ears, noses, and mouths of livestock.